"Here's a little something about Sublet: our mission is to be the go-to source for stylish and truly wearable clothing for the eco-minded consumer. We simply aim to cultivate a community that brings care to the garment industry and style to sustainable design. In an age of mass production, we only produce what we love and mull over every detail from the hem of a t-shirt to the drape of a cowl. ", says Inessah Selditz, 2006 Fashion Design graduate. 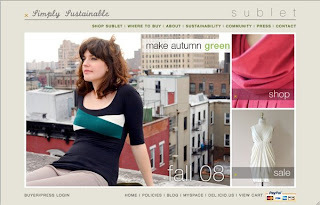 Visit http://www.subletclothing.com/ for details of sublet clothing.